Our harmonious Chinese New Year themed wooden box features a selection of the finest indulgences to properly celebrate the lunar New Year. 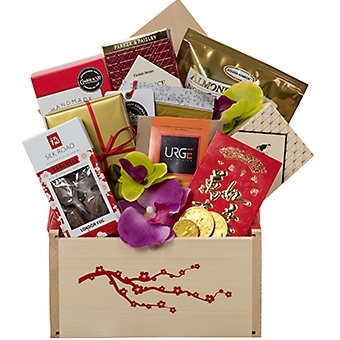 The Harmony gift box includes: cranberry shortbread cookies, almond nougat, mixed nuts, peanuts, Murchies tea, Urge chocolate, Silk Road caramels, Opulence chocolate bar and chocolate coins in a New Year's envelope. As with all our gifts, the Harmony Chinese New Year gift box is beautifully wrapped with a hand tied satin ribbon and includes a gift card with your message. All gift on www.pacificbasketco.com are exclusively designed and made by Pacific Basket Company.